The Lake Elsinore Storm have extended their player development contract with the Padres to 2020. 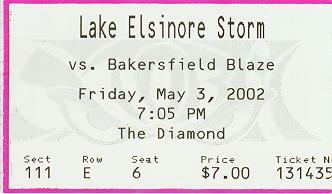 The Storm have been a Padres affiliate since 2001. I guess the Padres just wanted to wait until the end to make contract extensions. This entry was posted in Player Development Contracts and tagged Lake Elsinore Storm, mike mccann, minor league baseball, minorleaguesource.com, player development contract, San Diego Padres. Bookmark the permalink.